Democratic New York Rep. Alexandria Ocasio-Cortez unveiled the Green New Deal bill Thursday, and Massachusetts Sen. Ed Markey introduced a companion bill in the Senate. The resolution calls for “10-year national mobilizations” to fighting global warming by eliminating all carbon dioxide emissions from all sectors of the economy, including the power industry, agriculture, transportation and every building. U.S. 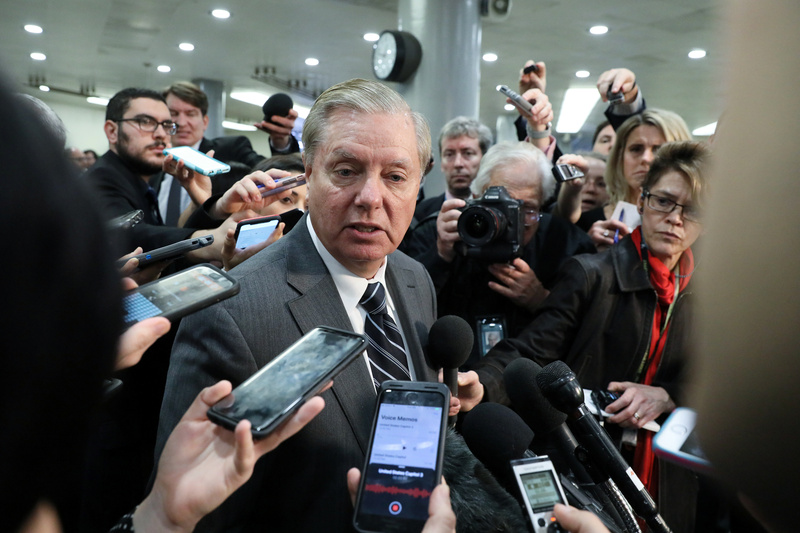 Senator Lindsey Graham (R-SC) speaks to reporters after attending a closed-door briefing, on the death of the journalist Jamal Khashoggi, by Central Intelligence Agency (CIA) Director Gina Haspel at the U.S. Capitol in Washington, U.S., December 4, 2018. REUTERS/Jonathan Ernst. The Green New Deal also calls for “repairing historic oppression” among certain groups and putting in place a slew of welfare programs, from universal health care to government jobs guarantees. “So really the heart of the Green New Deal is about social justice and it’s about allowing and fighting for things like fully funded pensions for coal miners in West Virginia, fighting for clean water in Flint, and fighting for the ability of indigenous peoples to take a leadership role in, in where we’re moving as a country,” Ocasio-Cortez told NPR Thursday. Democratic 2020 presidential hopefuls cosponsored the resolution, and it’s largely been seen as a litmus test for candidates seeking the Democratic nomination. However, House Democratic leadership panned the bill and Republicans see it as a boon to their re-election prospects. Graham’s comments reflect that optimism. Republicans cast the bill as “socialist” because of its unprecedented expansion of government control.